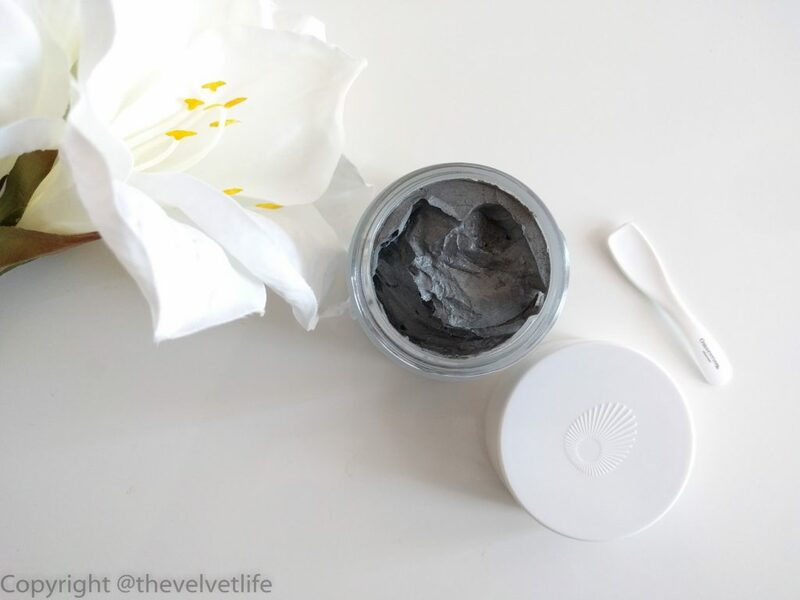 The Velvet Life - Page 71 of 130 - Musings of a Beauty Addict! Guerlain is a brand that has held high esteem for decades it was founded in 1828. The brand has a large loyal following, count me in, which is only possible when the creations from the brand are as good that they leave a positive impression on your personality and create that mark where you can feel the difference when you indulge in them. Guerlain is a brand with which my love started from a bronzer I purchased a few years back and I have not looked back. I was lucky to be able to try the new Guerlain Lingerie de Peau SPF20 Foundation and have been using it since last few weeks on and off that I am ready to write about it. 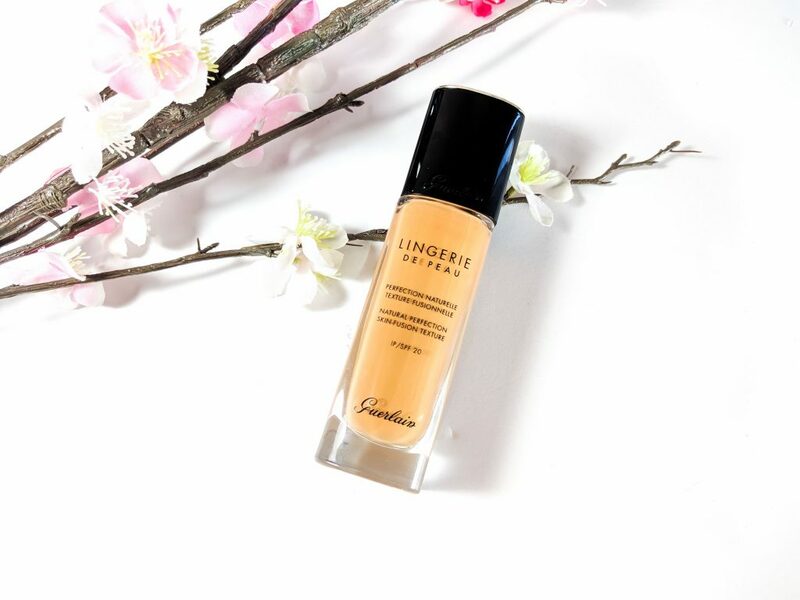 Guerlain’s Lingerie de Peau, as described on the Guerlain official website, turns the dream of a perfect foundation into reality – so skin-fusing and natural that it can’t be felt, can’t be seen. Its fresh, light texture glides onto the contours of the face like a second skin to enhance beauty naturally, without artifice, all day long. Guerlain Technology, Bio-Fusion micro-mesh, an unprecedented combination of contouring and smoothing stretch fibers with natural silk and linen fibers that are in total affinity with the skin. Hydrating agents bring softness and comfort throughout the day. The foundation is available in 18 shades with undertones pink, neutral, and warm. The packaging of the foundation is in a heavy glass pump bottle. The product has fragrance in it which is light floral which is very freshening while I apply it in the morning. The fragrance dissipates after some time. One pump is enough for me to give light coverage and with half or one extra pump, I am able to build up to a little less than full coverage, which is my preference these days. I use a brush normally to apply my foundation, and it works great with a dense foundation brush. I have also used my fingers to apply it to my face and it applied very nicely. It works well when mixed with Guerlain Abeille Royale Youth Watery Oil or if applied over it. The texture of the foundation is light and very smooth. It glides easily on the skin and blends nicely giving a very natural matte kind of finish. I would not say it is full matte but a very natural semi-matte. The skin looks more evened out, naturally radiant, and healthy. The formulation stays put for the whole day, I have used it during the day for over 10 hours and my skin still looked fresh. I did not felt the need of touchup, my skin looked naturally radiant as the day passed, from semi-matte to a little less than semi-matte, not oily in any way. For your reference, I have combination skin type with oily areas on the nose, forehead, and center of the cheeks. I had no issues with the formula oxidized after some time of wearing it. It did not settle in my pores or emphasize my problem areas. Now, coming to the shade range, there are 18 shades available with three undertones pink, neutral, and warm. 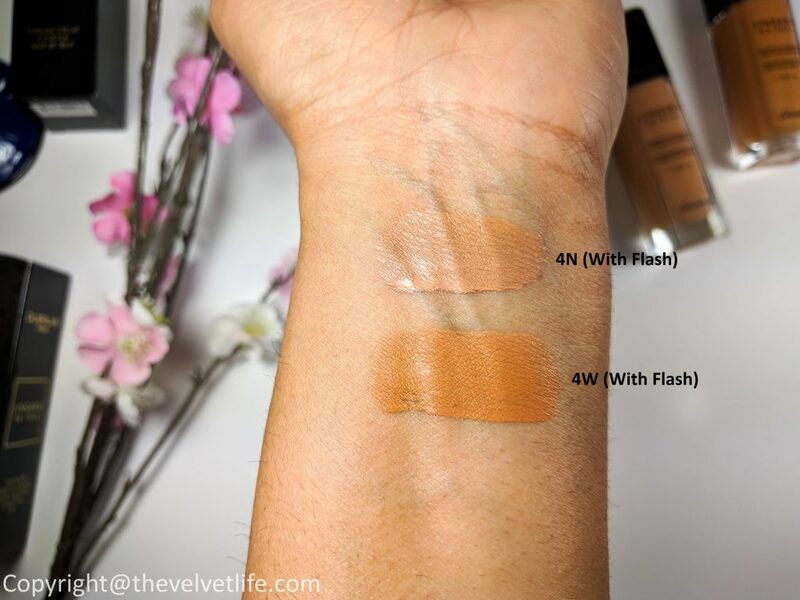 I first tried 4W for my medium tan skin tone with warm undertones, the shade turned out to be orange on me which was a surprise as I thought I have very yellow undertones and this one looked perfect. Then I tried 4N, which is the perfect match for my skin tone. I mentioned this just for your reference that in case you are planning to purchase this online, I would suggest you try the shades in store before purchasing. 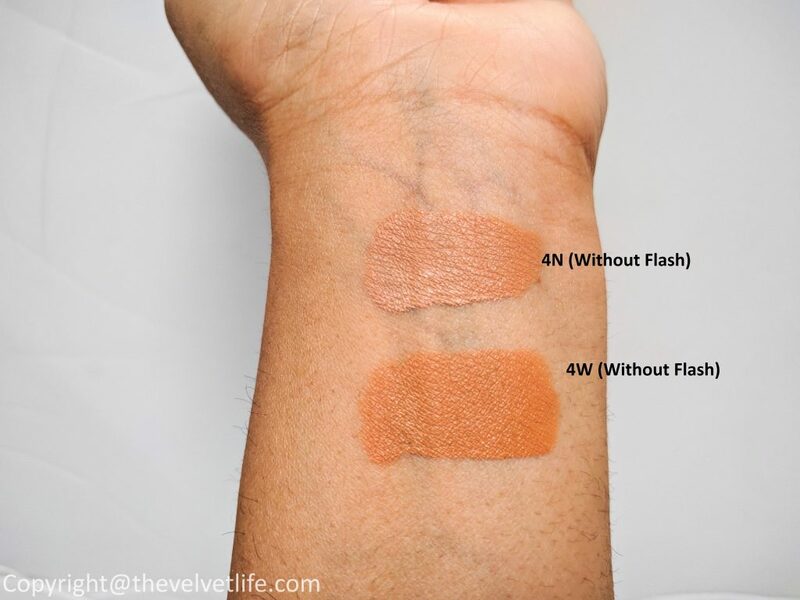 I have swatched shade 4 with undertones Warm and Neutral so that you can see the difference. I am really very satisfied with the formula and finish of this foundation. I have experienced no breakouts, no irritations with this foundation. The foundation has performed well with and without primer. The added SPF20 is a plus point as sometimes I just follow with this foundation after my moisturizer and skip the sunscreen. The other makeup sits nicely onto the foundation base. Overall, it is a really nice foundation if you are looking for a naturally radiant complexion which looks like second skin. 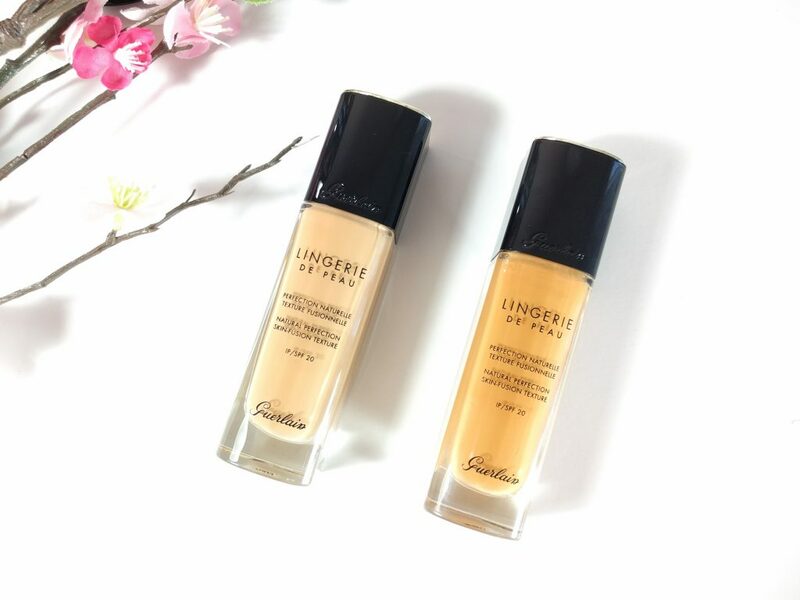 Guerlain Lingerie de Peau Foundation is available at Beautyboutique.ca, The Hudson’s Bay, Sephora Canada, and Guerlain boutiques. *DISCLAIMER – This is a press sample sent to ‘The Velvet Life’, all views and opinions are based on my own experience. Honey is one of my favorite superfood and I do not hesitate to apply it on my skin, or even on my kid’s skin. Honey has some amazing skin-saving properties. Honey is a natural anti-bacterial, making it perfect even for acne treatment and prevention. It is full of antioxidants making it perfect for anti-aging. It is very hydrating and soothing while giving a nice glow to the skin. And when I saw the products from Farmacy Beauty online while browsing through the new arrivals on the Sephora Canada website, I knew I had to try these, so they were in my Sephora ‘Loves List’ since then until I got a chance to try these last month. Farmacy Beauty is known for their unique farm-grown botanicals, which fuses age-old wisdom with cutting-edge technologies to create irritant-free bioactive formulations for fresh, radiant skin. Farmacy products are a synthesis of nature and science. The products contain Echinacea GreenEnvy™ which is a unique patent-protected variant of Echinacea Purpurea. GreenEnvy™ contains a high concentration of the phytochemical Cichoric Acid, a potent natural antioxidant which helps protect and firm the skin by inhibiting the enzymes that break down collagen. Cichoric Acid also normalizes the skin pigmentation process to promote a more evenly toned complexion. I have combination skin for your reference which is prone to congestion and acne, I have to be very careful when choosing the skin care products. 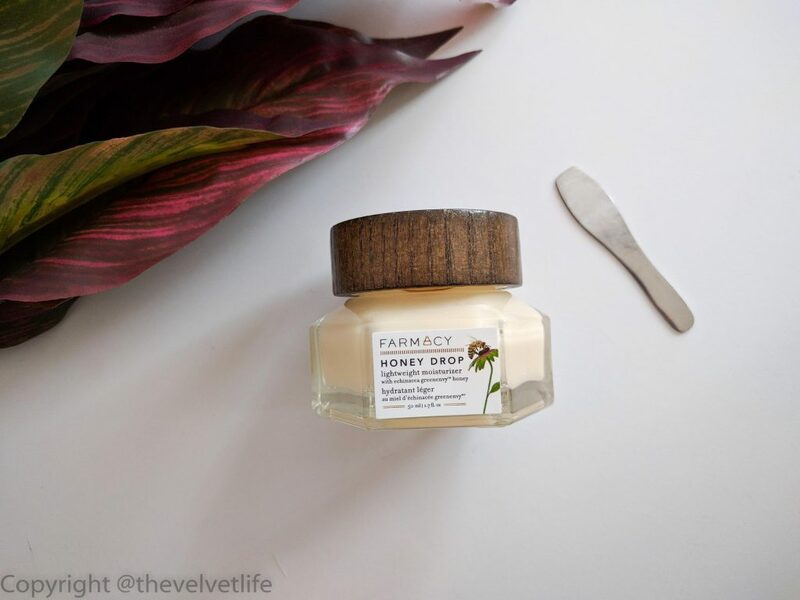 Farmacy Honey Drop Lightweight Moisturizer with Echinacea GreenEnvy™ and Farmacy Honey Savior All-In-One Skin Repair Salve have been a part of my skincare routine for more than six weeks. 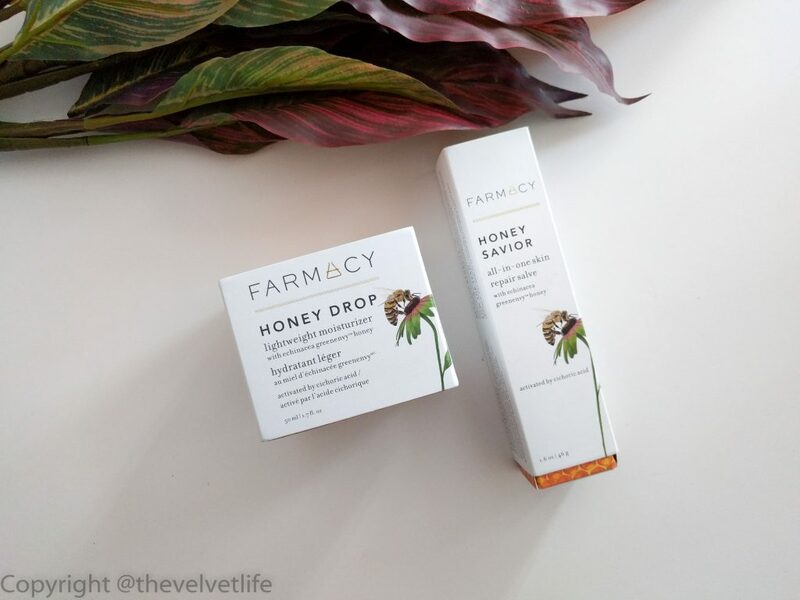 Farmacy Honey Drop Lightweight Moisturizer with Echinacea GreenEnvy™ is described as a long-lasting, lightweight moisturizer combining Echinacea GreenEnvy™ Honey, Triple Hyaluronic Acid Complex, and Cupuacu Butter Beads. 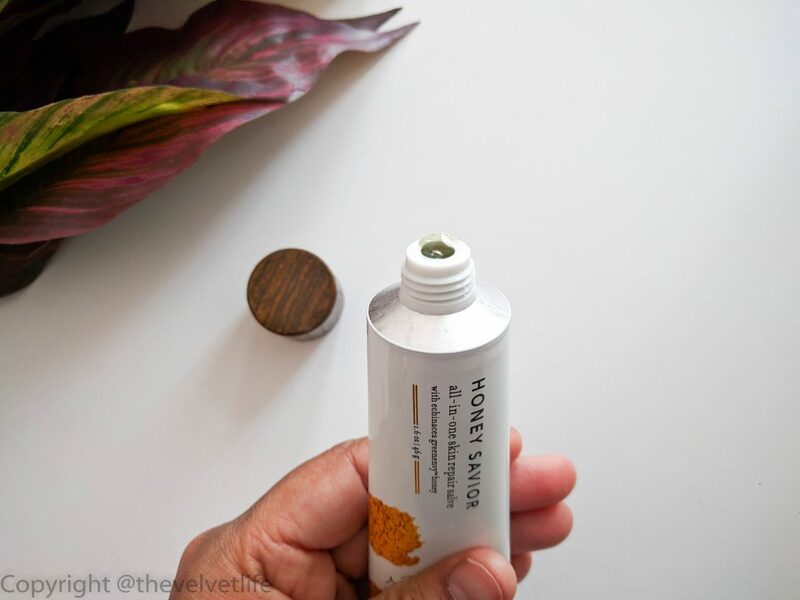 It is designed to promote a vibrant, glowing complexion, Honey Drop delivers powerful antioxidants to help nourish the skin and glides on effortlessly to create a smooth, hydrated finish. It is suitable for all skin types and great for dry skin, to boost skin’s natural moisture, soften and sooth the skin, improves visible firmness and elasticity, and to give an instant glow to the skin. It is formulated with naturally derived ingredients and not tested on animals. There are some interesting ingredients including 6 Superfoods and Botanicals, which I have linked here if you are interested to read more. The packaging of this moisturizer is so beautiful I must say, the heavy glass jar, the design, the wooden top of the jar with the ingenious magnetic spatula that attaches to the top so that to never lose it. I have been using this moisturizer during my day as well as night skincare routine. In the morning, I use it over my serum and before my sunscreen or makeup. It gives a very subtle glow to the skin, skin feels moisturized, soothed and smooth minus any dryness or flakiness. The makeup sit on pretty well over it, never had any issues of makeup rolling off the face. During my evening skincare routine, I apply this over my serum or night treatment as the last step. It does not leave any residue but sinks in pretty well into the skin. My skin has been behaving really well with this, it never inflamed or irritated my skin or the problem areas. The skin feels glowy, moisturized, and I did feel that soothing effect, even in my problem areas. This moisturizer is a winner for me and would highly recommend for all skin types. I did thought it to be sticky before I used it as it contains honey, it was never like that. The texture is very lightweight and sinks into the skin very fast. 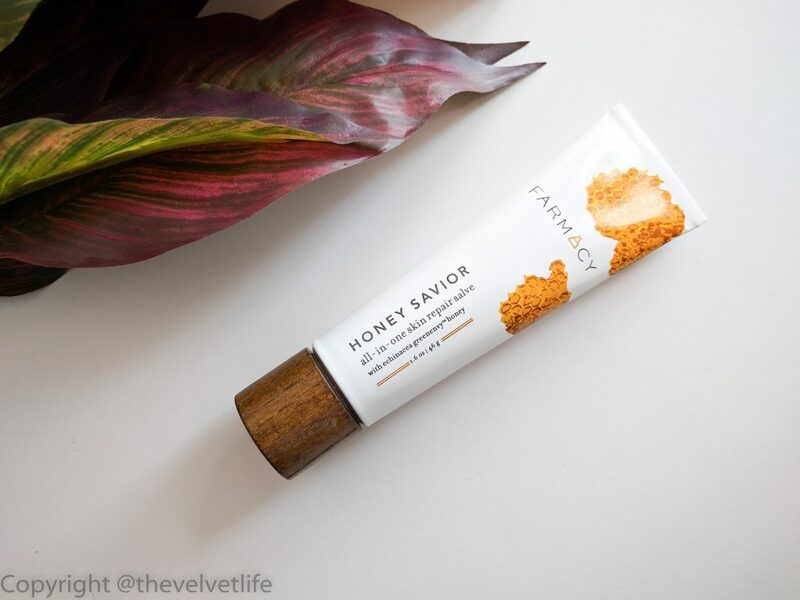 Farmacy Honey Savior All-In-One Skin Repair Salve is described as a soothing and healing multi-purpose salve that targets extra-dry skin, calms irritations and helps treat minor abrasions caused by dry, cracked skin. It contains a combination of honey (used since ancient times for wound care), amino acid-rich royal jelly to nourish the skin, and propolis, a natural antiseptic found in beehives. It is great for dry skin, dullness and uneven texture, good to be used on hands, elbows, legs, feet, sunburn, hair, after waxing, nails, brows, or as a highlighter. I have used it in all the ways I could think of before writing this review and the weather was perfect for me to create those pre-conditions and test how well it worked. I apply a small amount on the clean area and massage it until it is absorbed. It has worked great on soothing and healing the dry winter skin on my hands, elbows, legs, feet, and nails. The texture of the salve is thick and does need a good amount of massage, but it is all worth the results. On the face, it gives the perfect highlighter effect when used n the high points of the face. It has been a great brow tamer, the brows stay in place with this thick gel kind of formula. I used this on my arms and legs after waxing, and it has kept the skin moisturized without my usual bumps after waxing. I am going to take this salve for my upcoming vacation to see the effects of after-sun care. I will share my views on my Instagram or update this post. 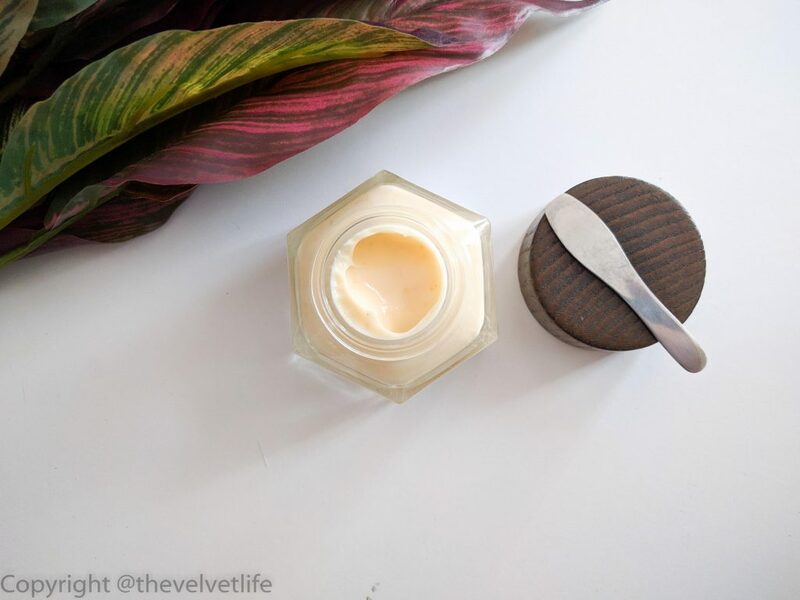 Overall, I am really satisfied with the claims and the results of both these products from Farmacy Beauty, Farmacy Honey Savior All-In-One Skin Repair Salve and Farmacy Honey Drop Lightweight Moisturizer with Echinacea GreenEnvy™. These two have made me more intrigued to try more from this brand. Farmacy Beauty Products are available at Sephora Canada. *DISCLAIMER – These are press samples sent to ‘The Velvet Life’, all views and opinions are based on my own experience. If you have been following me for some time, you might know I am a fan of Masks and they are an important part of my weekly or sometimes twice in a week skincare routine. And if you are a new reader, then I want to mention that I had the view that masks do not do good enough to be used every other day or on the weekends, my views were changed since I have become a regular with the masks. I mask and sometimes multi-mask depending on my skin’s needs. The more I am regular, the better my skin behaves. I reviewed Omorovicza Midnight Radiance Mask here a few weeks back which is a nice escape for me when I am in no mood for my multiple step skincare routines. I am going to review Omorovicza Ultramoor Mud Mask which I highly recommend if you have not yet seen the results from any face mask yet. Omorovicza Ultramoor Mud Mask is described to transform skin’s appearance in just a few minutes with this flash-lifting anti-aging mask. It provides gentle exfoliation and deep pore cleansing treatment to leave the facial contour more sharply defined and the complexion brighter. It is great for anti-aging, blemish-prone skin, and dull skin. It is suitable the most for oily, combination and normal skin types. The packaging of the mask is in a heavy glass frosted jar. I have been using this mask once a week and the results have been great. I apply this mask on my face and neck avoiding the eye area. I leave it on for 10 minutes and then remove with warm water. My skin feels clean, soft, and bright. I do not feel any dryness or irritation after using this mask. I see the pore size is reduced, and the skin is firm and smooth. With regular use, my breakouts have been under control and my skin looks healthy and lifted, I wouldn’t comment much on the lifting but I feel the skin is firm. The look of this mask and the texture does feel like the Deep Cleansing mask from the brand which I reviewed a few months back, linked here. The Deep Cleansing Mask clears congested pores and draws out impurities. The mask brightens skin with a glowing complexion and re-textures the epidermis. The Ultramoor Mud Mask, is a fast-acting anti-aging mask which transforms skin within minutes, the treatment plumps fine lines and tightens collagen fibers. Dead skin cells are eliminated for a brighter and more toned complexion. The Deep Cleansing Mask is suitable for dry, oily, combination and normal skin types and the Ultramoor Mud Mask is suitable for normal and oily skin. Both masks contain Hungarian Moor Mud which is extracted from Lake Héviz in Hungary, the mud is enriched with calcium and magnesium carbonates which detoxify and purify the skin. This mask has become a favorite for my combination skin which is prone to congestion and also a great pick-me-up during the week to give an extra boost to the skin. I would highly recommend you to check this mask for oily, combination, and normal skin types, you will see the difference even after the first use. 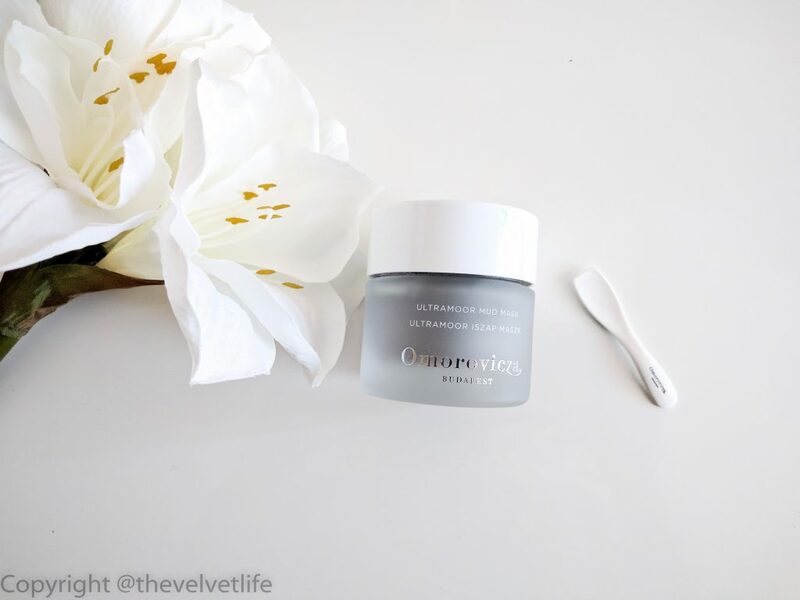 Omorovicza Ultramoor Mud Mask is available at Omorovicza, Space NK, Net-A-Porter, Sephora Canada.